Newtown Dentistry for Kids and Newtown Orthodontics - Creative Communications and Graphics, Inc.
Newtown Dentistry for Kids had just recently moved into a much larger office, and they needed a new website to match the grand scale of the new location. CCandG had origionally created 504kids.com as a Flash website back in 2004, but it was time for an upgrade. 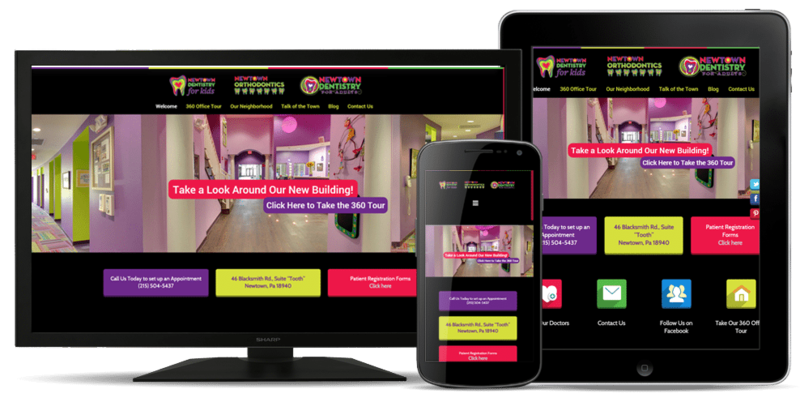 CCandG created the new website to reflect the welcoming atmosphere of the children’s dentist office. The new site offered more flexibility and ease-of-use for the client. The client wanted a site that was mobile-friendly and easy to navigate. CCandG utilized the power of WordPress to created a more modern site to match NDFK’s new office. The goal was to keep the site fun and informative. The client wanted a way for their customers to get an “inside look” at their new facility, so CCandG offered them the option of using a 360 Tour. The tour was captured using special cameras and uploaded through Google. This interactive tour gives visitors the ability to “walk” throughout the entire office. This allows new clients to become familiar with their new dentist office before even stepping foot in the building.